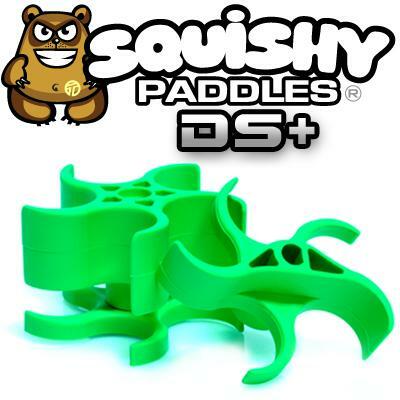 See why are our Squishy Paddles are voted BEST TIPPMANN UPGRADE AVAILABLE. 100% USA MADE. SOFTER THAN OTHERS, EASIER ON PAINT THAN OTHERS. LIFETIME GUARANTEE. TechT's Cyclone Feed Squishy Paddles® are designed to help players using any Tippmann Cyclone Feed eliminate ball breakage due to cold temperatures, brittle paint and high feed rates. Our Squishy Paddles were the first soft paddles ever created for the Tippmann. Since their release they have been considered by most as the best , and highest quality soft paddle upgrade for the Tippmann Cyclone Feed. When we make a product our goal is for it to be the best and most high quality part of its kind in all the world. With the Squishy Paddles, we are confident that we did that. Avoid being scammed by imitation "Squishy Paddles". The other guys paddles wear out quickly and will leave you frustrated on the field. The TechT Squishy Paddles also come with a Teflon washer that fits under the bottom paddle to ensure the paddles never bind with the bottom of the cyclone housing. Other don't. TechT Squishy Paddles come with a LIFETIME WARRANTY. Others don't. Super Rounded Edges for less chops. Comes with 2 different top Paddles. Choose which top paddle you like most based on how you play. Comments: Nothing Comes close to Techt's squishy paddles. Nothing is softer. Easy to install. Hard to wear out ! Comments: Great paddles. Super soft rubber and the new DS paddle cuts down on low ball hopper pop corning. Much better than stock, I would recommend these to anyone with a cyclone feed.